One of the grandest natural wonders in the world, Grand Canyon South Rim stretches 446 km (277 mi), reaching a width of 29 km (18 mi) and a depth of nearly 2 km (1.1 mi). Nearly 2 billion years old, the canyon walls expose nearly half of earth's lifespan, with layer after layer of rock cut by the Colorado River and its tributaries. For thousands of years this area was home to Native Americans, who built their settlements inside many of the canyon's caves. Today, the views offered by these ancient rocks attract visitors from around the world, who usually explore the South Rim's lookouts and Native American ruins. Hike along the Rim Trail to enjoy spectacular views of the canyon and surrounding desert landscape. Head back towards Grand Canyon Village to visit the Desert View Watchtower or the Buckey O’Neill Cabin, the longest continually standing structure on the South Rim. Most visitors do not hike. Of the nearly 5 million people who visit the Grand Canyon each year, 90% see it from the park's free shuttle buses or from their car at overlooks along the South Rim. 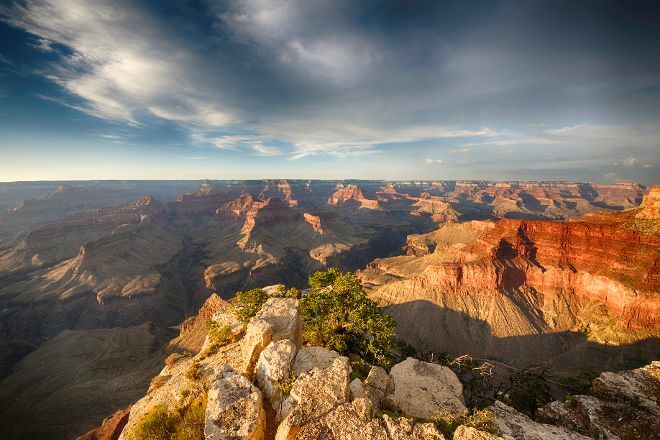 To visit Grand Canyon South Rim and get the most from your holiday in Grand Canyon National Park, create itinerary details personal to you using our Grand Canyon National Park road trip planning tool . Went to the Grand Canyon from Las Vegas! It was long and took about 30 miles one way to get to the South Rim! It was well worth those hours in the car, wonderful! We came late, unfortunately, but managed with the sunset! If I remember correctly cost about 400 € per car and go into the Park! We were here in the middle of november! Nice and warm in Las Vegas but a few degrees in the Grand Canyon we came in shorts and t-shirt. Was lucky that they sold shirts otherwise we had frozen to death! There are shuttlebussar on the field running around the area and stops at different spots, but gpr as good to drive around with your own vehicle.